Getting there: From MoPac heading north, take the Northland Drive exit and head east. Turn left onto Shoal Creek Boulevard and continue north for about half a mile. Northwest District Park will appear on the right first as an entrance for a small baseball stadium, which I used for my hike. However, the more appropriate parking area is at the northeast side of the park off of Albata Avenue. To get there turn right at Greenlawn Parkway and then work your way back to the south to Albata. 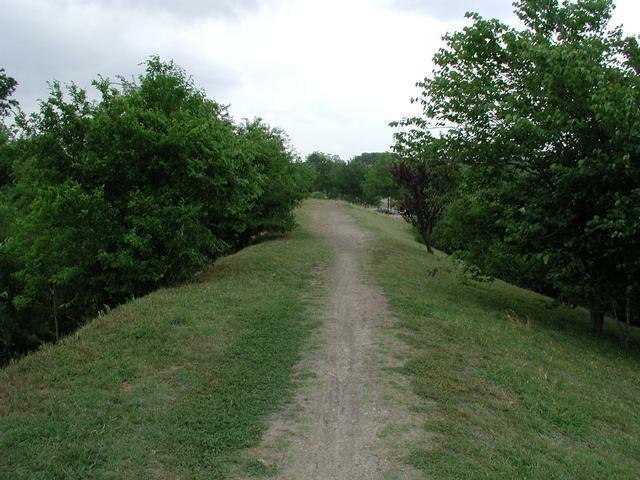 The Hike: The city of Austin does not claim that there is a hiking trail at Northwest District Park. In a way they're right. However, there is a path around the perimeter of the park that can be enjoyed by nearby residents. My hike started at the baseball stadium situated at the southernmost point of the park. Note that I do NOT recommend that you start your hike there. The normal parking for the park resides further north and I'll pass by the spot later on during my hike. While the parking area for the baseball diamond was open on this day that will not always be the case. While the park does not provide a wilderness experience the park does contain lots of wildlife, of a sort. Squirrels and birds are in abundance within the park boundaries. The trail starts off to the north climbing on an Earthen mound that parallels Shoal Creek to the left. The creek has been prone to flooding in the past and some parts of the park were put together from the property of former homes that have flooded through the years. The main portion of the park can be seen to the right. The facilities of the park include a swimming pool, basketball courts, tennis courts, picnic areas and playscapes. The walking path seems to be something of an afterthought, particularly on this side of the park. 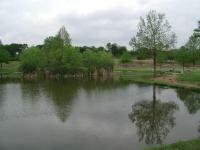 The highlight of the hike is the picturesque pond at the park's center, which includes a small island. The trail turns to the right when it runs to the northern park boundary. It crosses the driveway and dumps into the parking area in front of the pool. This is the spot where I recommend that you park when you visit. There are a lot more cars and the parking area will be open whenever the park is open. To complete the loop around the park continue to loop around the pool area. Once on the far side a paved path will emerge as it heads back towards the southern end of the park. On the right there are a large number of picnic tables and playscapes. During my visit there seemed to be several children's birthdays going on at the same time. 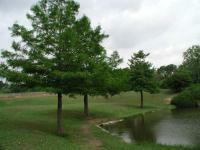 Planted along the pond's shore are several Cypress trees. The most interesting portion of the park is the pond that resides along the trail right before it rejoins the path leading back to the ballpark. There's a picturesque island in the middle of the pond and the surrounding area seems overloaded with squirrels and birds. 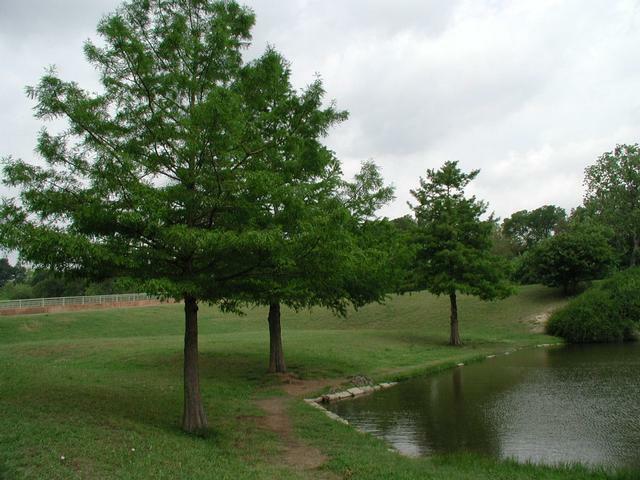 Trees along the banks of the pond appear to be Cypress, planted in a neat row along the pond shoreline. The trail climbs up the berm back onto the path used to join the southern end of the park with the north end. From this point on the hike I just retraced my steps back to the baseball parking area. I spent about 30 minutes in Northwest District Park and I might have been disappointed with the trip considering the number of people present. 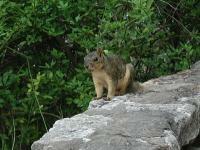 However, the pond, island and squirrels provided an enjoyable respite along the way. Shoal Creek is usually dry or close to it, so this park isn't all that scenic. There is a large swimming pool in the park. Apparently this park was much prettier but they rebuilt it to serve as a flood control retention pond in case of a repeat of the 1981 Shoal Creek flood. The pond was starting to look bad. Not really a destination that folks living far from the park may choose. The park provides lots of recreational amenties, but the trail does not provide what many would term hiking. However, the area around the park's pond is very nice and so the park provides a great place to go for an evening stroll with a stop by the pond to watch the birds and squirrels.